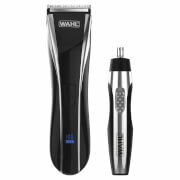 Ideal for the whole family, the Wahl Colour Coded Cordless Clipper is a convenient rechargeable hair clipper equipped with a colour coded key to help identify yours and your loved ones preferred cutting length. Powered by a Powerdrive™ motor for superior cutting action, the high performance cordless clipper utilises self-sharpening precision-ground blades to tackle even the thickest of hair, and has a soft touch grip for comfort and control. 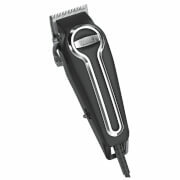 Colour coded for easy comb identification, the flexible and convenient hair clipper delivers 60 minutes of power on one full charge, and is equipped with 12 guide combs ranging from 0.8mm - 2.5mm. Durable storage case, detail trimmer, cord, 12 guide combs, two combs, scissors and style guide. 60 minutes of power on one full charge. Cutting length: 0.8mm - 2.5mm.